At 6-feet-2 and 225 pounds, Jeff Tesreau was big and strong, just the way John McGraw liked his pitchers. With a steady personality and solid work ethic, Tesreau quickly leaped to stardom after developing a devastating spitball, which he threw with the speed of a top fastball. 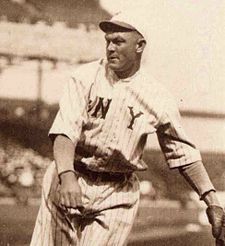 Over the course of his seven-year career he compiled a 119-72 record and 2.43 ERA while holding opponents to a .224 batting average (for comparison's sake, Walter Johnson's career mark was .227, Christy Mathewson's was .245, and Pete Alexander's was .250, though each pitched considerably longer than Tesreau), leading the National League in that category in each of his first three seasons. "That big fellow has the best spitball in the league," said Johnny Evers. "I think he is as good with the spitter as Ed Walsh." Despite Tesreau's success, a petty dispute with McGraw in 1918 caused him to quit professional baseball when he was only 29 years old. Charles Monroe Tesreau (TEZ-row) was born on March 5, 1888, on a farm near Ironton in the mining country of southeast Missouri (the encyclopedias list his birthplace as Silver Mine, a town that no longer exists). Charlie worked on the farm and completed eight years of school, setting off for nearby Perryville at age 17 to work in a lead mine and pitch for the mining company's team. His blazing fastball soon attracted the attention of the independent Perryville team of the Trolley League, which signed him for $50 a month. At Perryville in 1908 Tesreau won 37 of the 43 games he pitched, routinely striking out half the batters he faced. He signed with Austin of the Texas League, but when St. Louis Browns scout Charlie Barrett offered him a contract, he signed that one too. Austin appealed to the National Commission and won the rights to Tesreau. Managing Houston of the Texas League in 1909, Barrett ended up with Tesreau anyway when Austin released him. The scout-turned-manager pitched Tesreau in a series of exhibitions against the Browns, but St. Louis manager Jimmy McAleer wasn't interested in the big right-hander. After Houston dismissed Barrett, Tesreau went hopping from team to team around the Texas League and elsewhere, earning the nickname "Bullfrog." Scouts loved his fastball but managers feared his inability to control it. During a tryout with the Detroit Tigers, Tesreau injured Germany Schaefer and Charley O'Leary with errant fastballs, earning him a trip back to the Texas League. In 1910 he pitched the whole season for Shreveport and posted a 15-14 record with 179 strikeouts against only 71 walks. The New York Giants purchased him and brought him to New York in September. Though Tesreau didn't get into any games, he did catch the eye of sportswriter Bill McBeth, who noticed the big pitcher's resemblance to heavyweight boxer Jim Jeffries and nicknamed him "Jeff." At spring training in 1911, Giants special instructor Wilbert Robinson determined that Tesreau needed more control and an out pitch to go along with his above-average fastball. Robinson suggested that he try throwing the spitball. Big Jeff worked on the pitch all spring as he barnstormed throughout the South. One day in the lobby of the Hotel Murphy in Richmond, Virginia, after that day's exhibition was rained out, Damon Runyon reportedly overheard Tesreau say, "It would be a great day for bear hunting. Bears always bite best when it's raining." Runyon promptly dubbed him "The Big Bear Hunter of the Ozarks," even though he technically wasn't from the Ozarks. Later Jeff told interviewers that he had never hunted bear, either ("quail are my specialty," he explained), so the nickname was shortened to "The Big Bear of the Ozarks," or simply "The Ozark Bear." With more nicknames than reliable pitches, Tesreau spent the 1911 season with Toronto of the Eastern League under the tutelage of yet another former McGraw teammate, Joe Kelley. Continuing to work on his spitball, he compiled a 14-9 record but walked 96 batters in 213 innings. Robinson again worked extensively with Tesreau during spring training in 1912. This time Jeff opened the season with the Giants, starting the second game of the year on a dark, gloomy day at Brooklyn's Washington Park. He gave up only three hits and three walks but Giant errors caused his demise, 4-2. "Tesreau has curves which bend like barrel hoops and speed like lightning," wrote the New York Times. "He's just the kind of a strong man McGraw has been looking for." Jeff remained a regular starter throughout the season, compiling a seven-game winning streak down the stretch that included a no-hitter against the Phillies on September 6. For the year the rookie posted a 17-7 record and led the NL in the brand-new category of earned run average, his 1.96 mark beating out teammate Mathewson's 2.12. McGraw selected Tesreau, his most effective late-season pitcher, to start Game One of the World Series at the Polo Grounds, preferring that his rookie pitch in front of the home crowd. He ended up losing to Boston Red Sox ace Smoky Joe Wood, 4-3, and dropped a rematch in Game Four, 3-1, but McGraw turned to him once again in Game Seven, with the Giants down three games to two (with one tie). Tesreau rewarded his manager's confidence with an 11-4 win over Wood to tie the Series at three games apiece. "It was the worst game I pitched and the only one I won," he said. After his eventful rookie year, Tesreau remained one of the Giants top starters for the next five seasons. In 1913 he went 22-13 with a 2.17 ERA for another pennant-winning club, but in the World Series that year he lost his only start, 8-2, as rookie Joe Bush of the Philadelphia A's pitched a five-hitter. On May 16, 1914, Jeff was only one out away from the second no-hitter of his career when Joe Kelly of the Pirates lined a single for Pittsburgh's only hit of the game. While the rest of the Giants swooned late in the season to finish second to the Miracle Braves, Tesreau led the staff with a 26-10 record and 2.37 ERA. His eight shutouts were the best in the National League, and he also posted career highs in games started (41), complete games (26), innings (322.1), and strikeouts (189). After his big season Jeff barnstormed throughout the West and all the way to Hawaii as a member of an NL all-star team that won 29 of 50 games from an AL squad. The following year Tesreau went 19-16 with a 2.29 ERA despite pitching for a last-place club. Though he slipped a little in 1916-17, going a combined 27-22 even as the Giants rebounded to winning form, he reported to training camp in 1918 in excellent shape, ready to resume his past level of success. Prior to spring training McGraw had asked Tesreau to take the pitchers, catchers, and some out-of-condition players down South for some early work. When the manager arrived later, he asked Jeff to report on the players' evening activities. The big pitcher refused, claiming that a man's behavior away from the ballpark was his own business. That touched off a feud between the stubborn manager and his equally stubborn pitcher. Tesreau got off to a tough-luck start, going 4-4 but with a 2.32 ERA in his first dozen games, and suddenly left the team. He never pitched another game in Organized Baseball. With World War I underway, Tesreau took a job with Bethlehem Steel and went 7-4 in 12 games in the Steel League that year. He struck up an acquaintance with Tom Keady, the company's recreational executive who had connections at Dartmouth College. Dartmouth was looking for a new baseball coach and Keady recommended Tesreau for the position. Jeff refused to report to the Giants in 1919, and McGraw refused to release or trade him, so the big pitcher spent the year coaching the Dartmouth team. Despite an offer from the Boston Braves, Tesreau ended up spending the rest of his life coaching at Dartmouth, though he occasionally pitched for New England semipro teams like Treat 'Em Rough and Tesreau's Bears through 1925. He became a beloved figure as well as a successful coach on the Ivy League campus, frequently going up against his nemesis from the 1912 World Series, Joe Wood, who was coaching at Yale. Tesreau's career record from 1919-46 was 379 wins, 264 losses, and four ties. His teams won the Quadrangular League championship in 1925 and the Eastern League championship in 1930, 1935, 1936, and 1938. The 1930 team featured future New York Yankees third-baseman Red Rolfe (Dartmouth Class of '31), while the 1938 team featured Charles Tesreau Jr. (Dartmouth '38). From 1938 to 1941 Jeff managed the St. Albans Giants and Claremont Pilots in Vermont's Northern League, a fast-paced summer league that attracted top collegiate talent from across the country (among his players who made the majors were Snuffy Stirnweiss and Vic Raschi). In Tesreau's later years his weight ballooned to nearly 300 pounds. He was only 57 when he died in Hanover, New Hampshire, on September 24, 1946, five days after suffering a stroke during a fishing trip. Note: A slightly different version of this biography appeared in SABR's "Deadball Stars of the National League" (Brassey's, Inc., 2004), edited by Tom Simon.